Queen Elizabeth has been our monarch for over 60 years and her reign is surely set to become the longest ever in Britain. To say the Queen has tremendous staying power would be a great understatement. She has provided a strong focus of stability and continuity for this country in changing times. The virtues that she stands for are those of duty, responsibility, commitment and tradition. The Queen’s Sun is in Taurus, the sign most noted for stability. Taurus is a fixed sign and the chief concern for fixed signs is to preserve and maintain something to make it strong enough to last a long time. Her Moon is in Leo, another fixed sign known for its stamina but also for its nobility, natural leadership and generous spirit. The Ascendant is Capricorn, a sign that plays the long game and sees everything in terms of providing support for its mission or mountain to climb even if this takes considerable self sacrifice. There is a powerful Tsquare in the Queen’s chart between a Mars / Jupiter conjunction ( both in green ) in the first house in opposition to Neptune focusing onto Saturn at the very top of the chart. Mars and Jupiter are in Aquarius which shows she is recognised as a royal figure by people from all different countries and backgrounds. She is probably more widely respected than any other ruler or leader throughout the world. The very top of the chart rules the career and position in society, for Elizabeth this is the throne of England and having such a strong Saturn there shows the great responsibility she carries and the huge commitment that she has given throughout her lifetime. 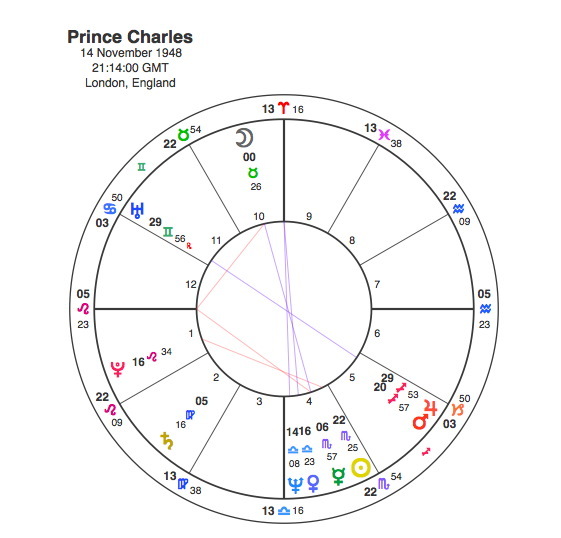 The Queen’s Sun is at exactly the same degree as Prince Charles’ Moon and the elevated placing of the Moon in his birthchart illustrates that his life has been dominated by his relationship with his mother. In the Queen’s chart Saturn plays the same role which shows that her duty to the throne and country has dominated her life. Charles Sun is conjunct the Queen’s Saturn which would create a strong but very serious relationship. From the Queen’s perspective, there are aspects of Charles’ life that would cause her considerable difficulty and push her to take on even more personal responsibility. From Charles’ viewpoint his mother could be seen as too serious and distant. Prince Andrew has the Moon at 25 degrees Scorpio also in conjunction with the Queen’s Saturn, so many of the issues in the Queen’s relationship with Charles would apply to Andrew as well. Andrew’s Sun is opposite Pluto which suggests a sudden and powerful change in his life which would impact on those around him and Charles has a similar Sun / Pluto contact. 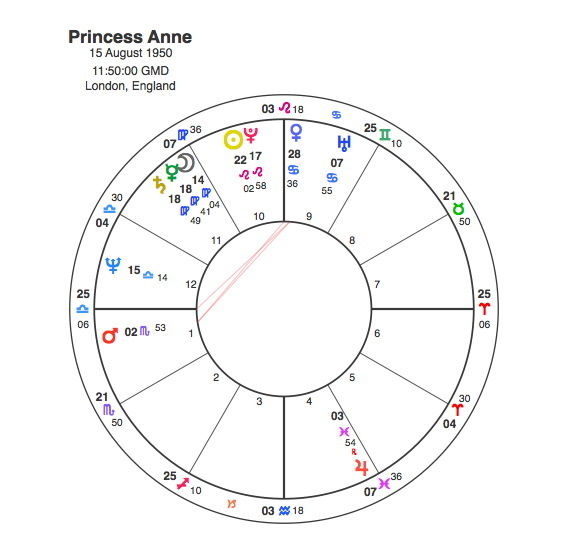 Princess Anne has her Sun at 22 degrees of Leo which also falls into the Queen’s Tsquare in 90 degree aspect to her Saturn. Anne’s Sun is conjunct Pluto again pointing to significant unexpected changes in her life. It is extraordinary that all of the Queen’s children have strong Sun / Pluto aspects at birth. 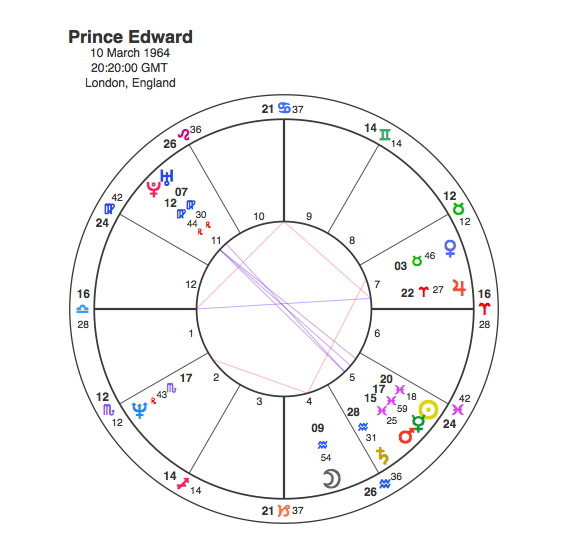 Prince Edward also has the Sun in opposition to Pluto although his does not create aspects to major planets in the Queen’s chart. 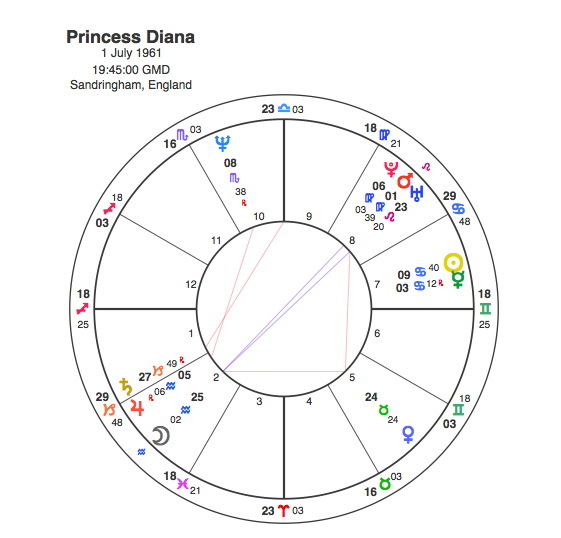 Princess Diana’s has a powerful Tsquare pointing to Venus at 24 degrees of Taurus which reveals the magnetic qualities of the most photographed woman in the world. Her Venus is exactly opposite the Queen’s Saturn suggesting that Diana’s celebrity and Elizabeth’s sense of responsibility would pull strongly in very different directions creating a tension that would be difficult to resolve. Prince Philip has the Moon at 22 degrees of Leo right on the Queen’s Tsquare also in strong aspect to all these other planets. One major issue that arises from having so many family members with the same degrees of their charts prominent is that they would all be affected by the same transits at the same time. The Queen described the year 1992 as her annus horribilis. Prince Andrew and Sarah, the Duchess of York separated, Princess Anne and Mark Phillips divorced but the biggest blow was the revelations in Andrew Morton’s book about Princess Diana which came out that year. Charles and Diana separated and the pressure on the institution of the Royal Family was enormous. As if symbolic of all this, Windsor Castle caught fire and suffered severe damage. At the time many people commented that the whole fabric of the Royal Family and even the Monarchy was crumbling. Pluto moves very slowly and in 1992 was at 22 – 25 degrees of Scorpio, in conjunction with the Queen’s Saturn, Charles’ Sun and Andrew’s Moon, in opposition to Diana’s Venus and in square aspect to Anne and Philip’s Suns. The sudden and powerful changes indicated in the birthcharts of Charles, Anne and Andrew all came at once as Pluto made the only aspect possible to these natal positions in their lifetime. Pluto’s transits are usually sudden and unpredictable, this one in 1992 was like a bomb going off . The biggest single event In the Queen’s life would have been ascending to the throne in 1952 with the Coronation in 1953. In 1952 – 3 Pluto had moved the relatively small distance to 20 – 24 degrees Leo to conjunct her Neptune and opposite Mars and Jupiter whilst sending a square aspect to Saturn again triggering the Tsquare. This time Pluto was conjunct Neptune rather than Saturn so the atmosphere was much more one of celebration rather than the depression of 1992. It was, however, linked with the natural sadness of losing her father, George V1, along with the dramatically increased level of responsibility and self sacrifice that any such aspect to a Saturn Tsquare would inevitably bring. 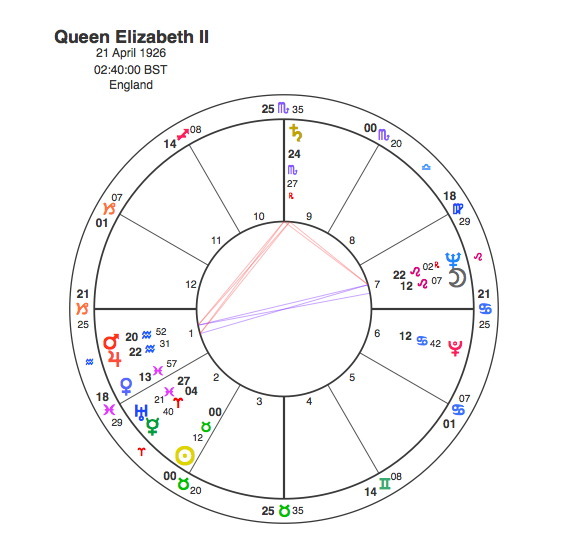 Incidentally George V1 had a Moon / Uranus conjunction at 22 – 25 degrees of Scorpio with the Moon exactly on the Queen’s Saturn showing a strong connection between a sudden unexpected event occurring to him and the increased level of responsibility of monarchy for her. Pluto in 1952 was in square aspect to his Moon as well as the Queen’s Saturn. A Tsquare can only be set off twice at most by Pluto’s transits in any lifetime. The synchronicity of these two events is extraordinary. The other major event in the Queen’s life was her marriage to Prince Philip. Both the Queen and Philip have their Moons conjunct Neptune in Leo in the 7th house of marriage. This is an incredible combination and explains why there is such a deep, profound sympathy and understanding between them. 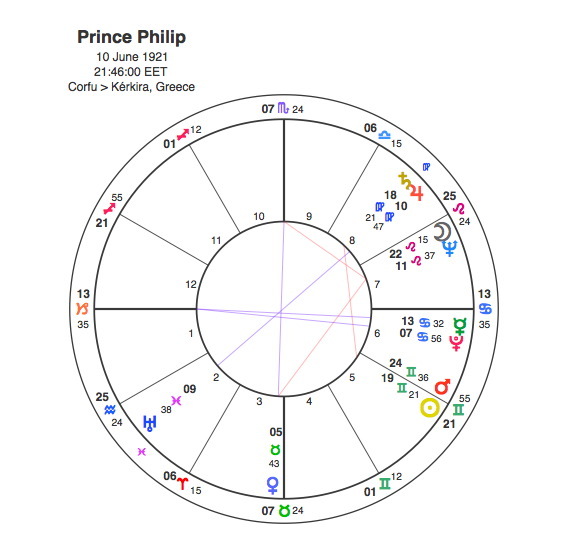 Elizabeth’s Moon is exactly conjunct Philip’s Neptune, Philip’s Moon is exactly conjunct the Queen’s Neptune. They married in 1947 when Pluto had reached the Queen’s Moon and Philip’s Neptune. In 1952 when she became Queen, Pluto was conjunct Elizabeth’s Neptune and Philip’s Moon. Pluto has been a major player in the lives of the House of Windsor. Wondering where Prince Philips mother – Princess Alice – fits with this group. Her life seems to have been so tumultuous that Pluto must have been very active as she seems to have a phoenix like ability for change. Yes absolutely. Princess Alice had Pluto in the 10th house at the apex of a TSquare involving her Sun and Mars in Pisces and Jupiter. Also Pluto was conjunct Alice’s Moon in 1930 when Andrew abandoned her. What about when pluto crosses her ASC …right near the time of the grand conjunction soon? Thanks Jen. Yes this is really important. The transit still has some time to run but I would expect it along with Uranus being conjunct her Sun to coincide with her handing over the job to Charles, one way or another.